Hundreds gathered in Manchester yesterday for the launch of SAScon, a new SEO and social conference organised by a variety of Manchester SEO agencies. theEword copywriter Tom Mason attended the event and here, shares some of the pearls of social medium wisdom he picked up from the day. For an inaugural event, SAScon boasted an ambitious scope; the programme – a mix of SEO, marketing and social panels – had enticed a number of world-renowned speakers. Indeed, the conference attracted employees from Google, YouTube plus several household names in the SEO world. Bruce Daisley, head of sales of YouTube UK, presented the morning's keynote presentation. Daisley was an engaging and entertaining speaker and his speech incorporated a number of revealing statistics relating to user behaviour on YouTube. 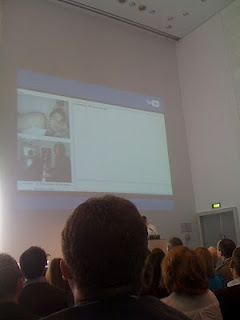 During the presentation, Daisley hinted YouTube would be investing more energy into live video streaming (the company has already had some success with live coverage of Jay-Z and U2 concerts) and that logistical elements were being put in place to allow third-parties to begin covering their own live efforts. Mobile marketers also got something to chew on during the speech; the average iPhone user watches 3-4 videos on YouTube every single day. The conference then offered attendees the chance to attend a number of different panels throughout the day. Still, a conference is only as good as its speakers, although thankfully, SAScon attracted a collection of leading-thinkers in the social media field. The Search and Social media panel saw Massimo Burgio (founder of SEMPO), Joost de Valk, Google's Andrew Barke and Lyndon Antcliffe discuss the evolution of social media and SEO. A number of interesting points were raised from the roundtable discussion, notably de Valk's comment that social media doesn't revolve around Facebook and Twitter (Only 10 per cent of users in his native Holland have Facebook accounts. The majority use the Dutch social networking site Hyves). Valk went on to discuss his concerns over privacy on social media, in particular on Facebook. Elsewhere, Barke also responded to criticism of Google social search. "Everything we do is a ranking issue. We're trying to provide the most relevant information," he said. The panel seemed unconvinced. All however, did agree on the fact that a social marketing campaign needs to have an end goal in mind. Social media was explored when esteemed social media marketers Judith Lewis, Paul Fabretti, Massimo Burgio, Will McInnes, Phillip Buxton and James Lowery sat down to discuss the fundamentals behind a social campaign. All of the speakers agreed a social media was at its most effective when deployed with an end goal in mind. "The people who have a specific goal will get the most out of it," said James Lowery. Meanwhile, Judith Lewis was quick to point out that good social campaigns engage with the customer. "Social media is about interaction," she commented. Paul Fabretti also highlighted the need for preparation of consumer research: "I would spend two or three weeks looking at the conversations and the competitors. Make sure the mediums and channels [of the campaign] are relevant." 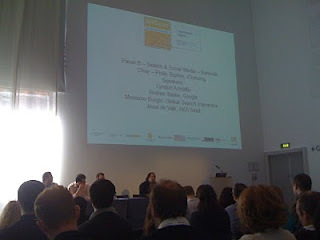 Finding the right medium to appeal to users was explored in the 'Running a Pan-European Search Campaign' panel. The workshop, which included Bas Van Den Beld, Andy Atkins-Kruger, Massimo Burgio and Kristjan Mar Hauksson, explored the techniques SEO companies can used to appeal to different EU markets. Bas Van Den Beld started the session with some very strong points about history and culture. "Europe is a massive melting pot of different cultures. Lifestyles and attitudes vary considerably depending on the country. There are over 200 languages in Europe and different countries require different approaches." The panel went on to discuss how to target different countries. In particular, Atkins-Kruger talked about the need for correct translation and insider-knowledge when working on a foreign campaign. One of the final panels saw a discussion about the use of social media for corporate marketing. Phil Jones, Malcom Coles, Neil Hardy, Will McInnes and Ian Croxford discussed how a successful SM strategy could be incorporated into a pre-existing marketing push. "Social media isn't the silver bullet," said Phil Jones. "It requires time, attention and trust in order to be successful." Coles meanwhile stressed the importance of experimentation. Referencing the recent social media catastrophes of Vodafone and Dominos, he said: "People have a short memory when it comes to social media." Jones, the sales and marketing director of Brother UK, co-ordinated the company's initial foray into Twitter. He went on to discuss the future of SM strategy and revealed that he could envisage a future of 24-hour call centres devoted to social media response. "Engagement often leads to marriage."